We "Geo Enviro Solution" is a leading manufacturer of Waste Water Treatment Plant lie Effluent Treatment Plant, Sewage Treatment Plant in different Technologies. Based on the client requirement we design a system compact & economic. Our Design will work efficiently & will never failure. Our ultimate aim is customer satisfaction & result orientation. We "Geo Enviro Solution" is a leading design & manufacturer of Waste Water Treatment Plant using "Electrocoagulation" Process... Electrocoagulation is an electro-chemical process that simultaneously removes heavy metals, suspended solids, emulsified organics and many other contaminants from water using electricity instead of expensive chemical reagents. The process uses electricity and sacrificial plates to combine with contaminants in a waste stream, producing insoluble oxides & hydroxides - floc - that are easily seperated from the water. Electrocoagulation is the scientific discipline of utilizing electricity as the electromotive force to drive chemical reactions in a solution, suspension, or emulsion. A special form of direct current is introduced into the aqueous stream as it passes between predetermined electrodes in the Electrocoagulation Module. This energy from the electricity is the engine or driving force to shift the equilibrium of a reaction to less than equilibrium levels, thus providing a mechanism for removing dissolved, suspended or emulsified molecules, elements or ions to very minute levels in an aqueous stream. 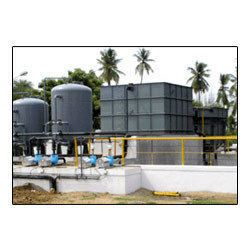 Its an advanced Treatment to treat the waste water & comparing to biological process so many advantages are involved in this process... We have an expert for the complete design of the system & we also provide complete solution for the all waste water related issues & even we can provide service support for our clients all over the world.